Schaumburg, IL – April 16, 2019 – Given the strong acceptance and growing popularity of the INX Color Catalog with brand owners, designers and metal decorators, INX International Ink Co. (booth 1121) will direct attention to its proven success with daily demonstrations at Cannex and Fillex, May 1-3 at the Colorado Convention Center in Denver. INX Project Specialist Sarah Jacks is scheduled to inform booth visitors about Color Standardization for Can Design & Decorating from Proof to Production. Each session will begin at 2 p.m. Attendees also will have the opportunity to create, print and leave the booth with their own sample can design. “Since the INX Color Catalog was introduced one year ago, there are now more than 100 Color Catalogs in the field. Brand owners and others have discovered how the catalog can bring their brand to life in 2-piece cans in a more efficient and effective manner,” said Jacks. Her daily presentations will explain how brand owners and others can select and approve color efficiently. This impacts the bottom line by reducing lead times and getting labels to market quicker. She also plans to show how the INX Color Perfection process works – from initial design process steps through production – to deliver color standardization for can design and decorating. The INX Color Perfection process involves several advanced components. 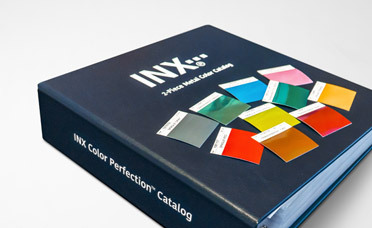 The INX 2-Piece Metal Color Catalog provides over 600 removable metal color swatches. It not only allows for comparison purposes, but offers truly accurate, reproducible and consistent color on metal. Combined with the INX Digital color library, digital proofing capability and educational tools specific to metal decorating, all help to streamline and standardize the process. As the industry leader in metal decorating technology, INX will also feature special effect inks and coatings, a complete array of metal decorating products, services and digital printing capabilities such as the CP100 UV Digital Cylindrical printer. A full team of INX representatives will be in booth 1121 to answer questions, and the INX Color Catalog will be on display and available to review. Visit www.inxinternational.com for more information or contact your INX representative to arrange a meeting.